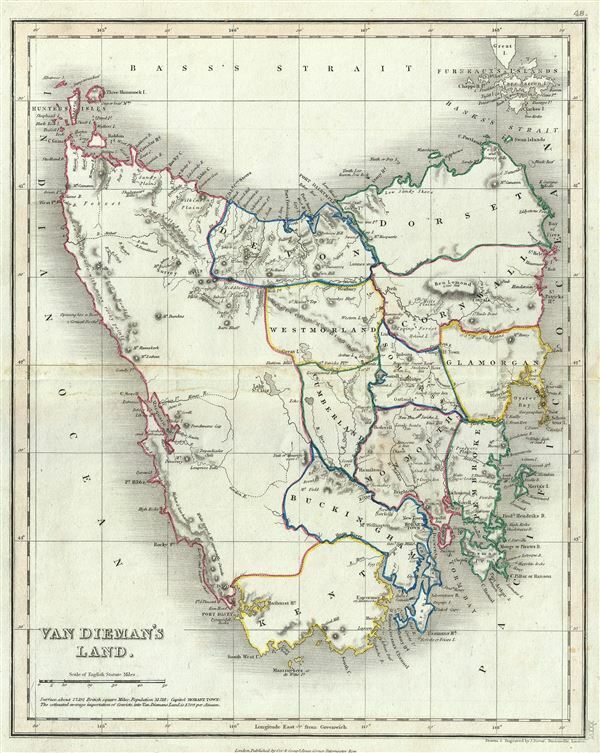 This is a beautiful 1860 map of Van Diemen's Land or Tasmania, issued by John Dower. The map covers the entire island of Tasmania in considerable detail noting towns, lakes, mountain ranges and other topographical features. Van Diemen's Land, was colonized by the British as a Penal Colony under the name 'Van Diemen's Land,' referring to the Dutch East India Company governor who sponsored Tasman's historic 1642 discovery of the island. In 1856, a few year before this map was issued, Van Diemen's Land was granted responsible self-government and renamed 'Tasmania.' This map was engraved by J. Dower and issued in 1860 by Orr and Company. National Library of Australia, Map Room, MAP T 480.